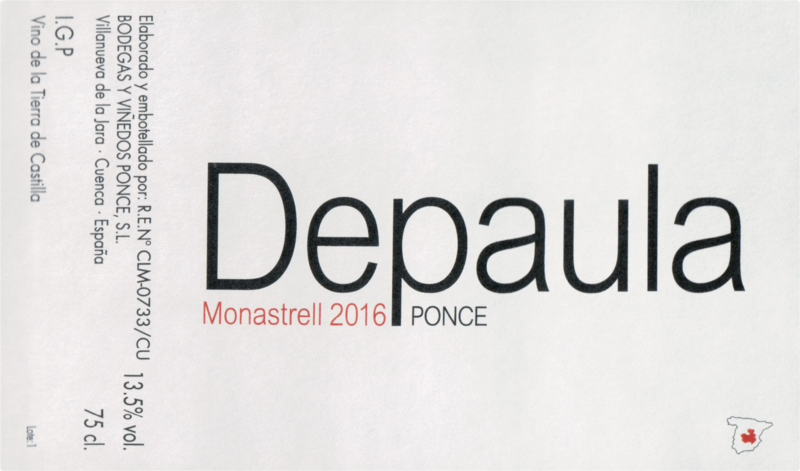 J. Antonio Ponce offers us a delightful little Monastrell wine with his Depaula. If you've ever come across vegetal notes in wines made from this grape and they've not really been to your taste, have no fear; it has some of those notes but they're very pleasant, and not at all bitter; they give the wine character, conferring vivacity and personality. Depaula is fresh and mineral, with profound aromas, ripe red fruit, toasty notes, caramel and sweetish touches, as well as hints of gunpowder. Once poured into the glass it's lusciously sweet on the nose, and reveals the Monastrell's energetic character on swirling it around. On the palate it gives the feeling of a complete wine, with chewy fruit, and it has that rustic element typical of the variety, yet still very polished. Remarkably complex for a wine at this price, a rounded wine that leaves a most pleasant sensation at the end, a merit justly attributed to its producer of course. Don't be misled by its price, as you can decant it! This is a wine with plenty of vitality and sinew, especially when it's young, and it will benefit from a good decanting.